Shifu Shi Yan Zi is one of the chief disciples of the Shi Yong Xin, Abbot of the Shaolin Temple in China, and a prominent Gong Fu master among the 34th generation Shaolin monks. In 1983 Shi Yan Zi was trained at the Martial Arts College of Shaolin and became a disciple of the Abbot Shi Yong Xin in 1987. Under the venerable abbot’s guidance Shifu Yan Zi practised Chan (Buddhist meditation) and Gong Fu in the Shaolin Temple for ten years and eventually mastered Shaolin Qi Gong, traditional styles of martial art, Sanshou (or sanda), and other unique styles of Shaolin Gong Fu. During his ten years of training in the Shaolin Temple under the instruction of the Abbot Shi YongXin, Shi Yan Zi not only mastered the skills of Chan and Gong Fu, but also built up an honest and frank characters. Being instructed by the Abbot, Shi Yan Zi with his own effort was selected and promoted to the top rank of Shaolin Gong Fu trainees and finally his mastery of various styles of Shaolin Gong Fu, including Shaolin Sanshou, Steel jacket, and Xin Yi Ba (mastery of mind and form), has verified him a Shaolin Gong Fu Master after many competitions. Xin Yi Ba is a unique Gong Fu of the Shaolin Temple, and it consists of twelve skills. Mastery of each skill can produce strong power and can easily defeat many kinds of attack. Xin Yi Ba requires the practitioners to have its fighting skill and forms of fighting, and essentially requires the practitioners to understand all its teachings and to correctly use them. All these abilities of understanding and using Xin Yi Ba Gong Fu can be gained through individual practice and also practice with others. After years of practice, Shi Yan Zi has enlightened himself about the essence of Xin Yi Ba Gong Fu and is able to apply it in many styles of martial art and Gong Fu. Because of this he was sent by the abbot of Shaolin Temple to participate in many conferences and martial art and Gong Fu competitions throughout the world. By applying the essence of Xin Yi Ba teachings, Shi Yan Zi had an unbeaten winning streak in martial arts and Gong Fu competitions at national and international level. This further proves that all the skills of Shaolin Gong Fu that he mastered are useful and practicable in real contests. Hence he truly mastered and inherited Shaolin Sanshou and Xin Yi Ba, the unique skills of the Shaolin Temple. It it is said that mastering one skill of Xin Yi Ba is better than processing many hundreds of skills. Further, Shifu says, “when one understands the essence of Chan and realises the nature of Chan one will gain the result of practising Chan; when one understands the essence of Gong Fu and realises the nature of Gong Fu one is able to reach the top Gong Fu through practice”.This statement is a good explanation of Abbot Xi Yong Xin’s theory, “ The oneness of Chan and Fist (boxing)”. In 2014 Shi Yan Zi returned to China to set up Shaolin International School on the foothills of the Songshan mountain range just a short walk away from the Shaolin Temple. 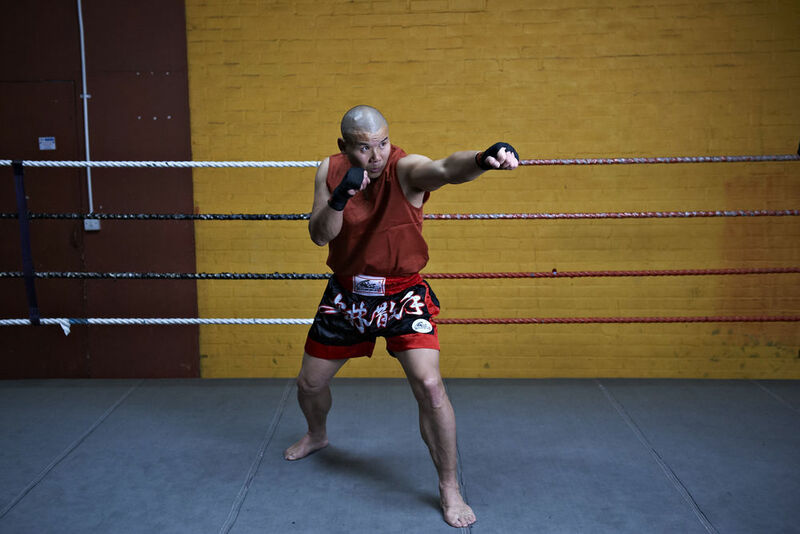 Since then he has tirelessly taught and developed the Shaolin and Sanshou skills of his students there, and has recently guided two of his top students in the Hero Legends preliminary bouts. The school is still young but is developing rapidly, with the students improving everyday by leaps and bounds. It features dorm rooms and training full facilities, modern weight training equipment, a full-sized ring, and traditional Shaolin training weights to be used in a specially constructed outdoor training area. The surrounding scenery is beautiful and the mountain trails are perfect and awe-inspiring for those early morning runs. Shi Yan Zi has been tireless and humble in his promotion of Shaolin culture and consequently been invited to many conferences and TV studios around the world. Recently he was featured in a full-length documentary aired on CCTV, which gave an insight into the lives of his disciples and his Shaolin mission. 2014.01.03. 46 years old former Shaolin monk Shi Yan Zi is currently teaching Chinese kung fu in the UK; he trained in the Shaolin Temple for many years after which he became Chinese national sanshou champion in 1988.